Looking set to be the horror film of the year, the spine-chilling Hereditary lands today in UK cinemas. It premiered in London at the Sundance Film Festival’s spinoff in the capital, part of a carefully programmed lineup with a host of stellar filmmakers on display. Here are some of the films from Sundance London 2018 that we feel are worth looking out for on a screen near you. Extensively hyped since Sundance in January, Hereditary is anything but your average fright-fest. The new film from director Ari Aster is an expertly crafted work that delves into family dynamics and the twisted influence of the paranormal. Toni Collette is superb as Annie, a mother dealing with multiple tragedies in her life that begin to seep uncontrollably and insidiously into all aspects of her existence. 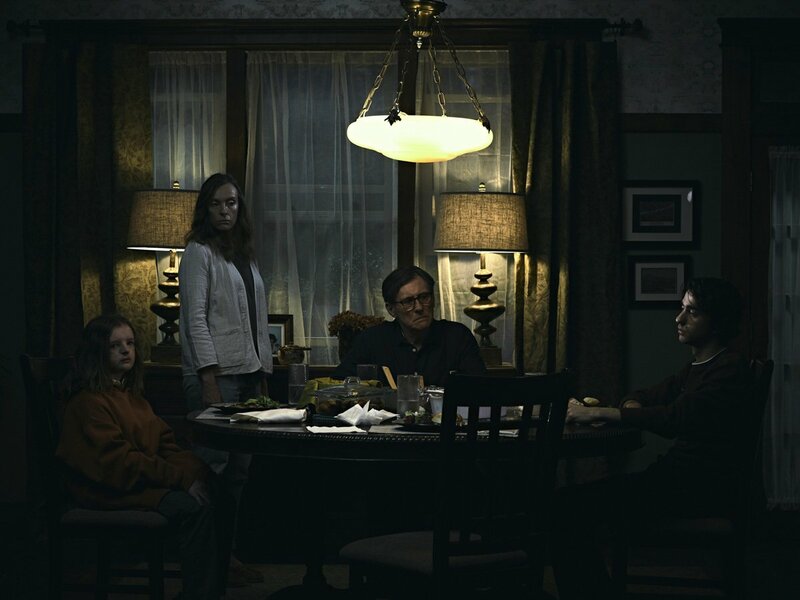 Hereditary is a serious horror film, playing deftly with tempo and lighting to create fear at every turn. It won’t be forgotten easily. The first feature length film from documentary director Crystal Moselle, Skate Kitchen creates a fictionalised version of the titular, real life skater girl gang based in Manhattan. The film follows protagonist Camille as she discovers a new band of friends away from her troublesome family life, and the inevitable adolescent consequences of trying to fit in. With over 60,000 followers on their Instagram page the Skate Kitchen girls ooze an undeniable, effortless cool, and their genuine bond is joyous and compelling to watch on screen. Master writer and director Paul Schrader returns with First Reformed, an intensive course in denial, reconciliation, and the contradictions of life that will doom us. Ethan Hawke is electric as Reverend Toller, a troubled pastor who lives alone in his private church residence with his whiskey and his diary. Toller is an unsympathetic and harsh man who, following the suicide of a man he had counselled, sets about a new life of extremist thought and radical change. There are hints of Schrader’s work on Travis Bickle in Martin Scorsese’s Taxi Driver in this depiction of a troubled mind questioning and championing what he is capable of, no matter how disastrous. The director of Winter’s Bone returns with another exploration of blue collar American life in the wilderness, as a father and daughter build a world together in the outdoors. Debra Granik’s film is lush and alive with greenery, beautiful landscapes providing a soft background for a harsher tale of despair and survival. Tom’s father’s struggle with his past demons begins to leave little room for his daughter to find a sanctuary anywhere, nowhere to build a solid foundation in her life. Leave No Trace is profound, a study of moving through a life with nowhere to go. Running alongside her father from a past that is not her own is inevitably unsustainable for Tom, and the film documents this painful journey with a delicate touch and compassionate performances from both lead actors. Maia Mitchell and Cami Morrone star in this revamp of the bro stoner comedy with a female-driven narrative. Directed by Augustine Frizzell, Never Goin’ Back follows Jessie and Angela, seventeen-year olds who spend their days at their dead end diner job and their nights partying with an endless supply of weed. The girls are witty and brash, standing up against the idiocy of Jessie’s brother and his loser friends in the face of their ability to create havoc for everyone. Never Goin’ Back is a real laugh at times, never dwelling too long on the real sadness of the girls’ predicament and choosing to look forward to their simple hopes of a beach holiday and making next month’s rent. Comedian Bo Burnham has directed his first feature film, an astute and charming look at the life of a young teenage girl in her last week of middle school. Eighth Grade is a buoyant and achingly familiar story of adolescent angst and the struggle to fit in. Elsie Fisher is remarkable as protagonist Kayla, desperate for a hint of self-confidence and a supportive friendship circle. The film offers no judgment or condemnation of Kayla’s social media-savvy generation, instead chronicling the pressures of growing up in our digital age with consideration and gentle humour. A defiant debut from Burnham.